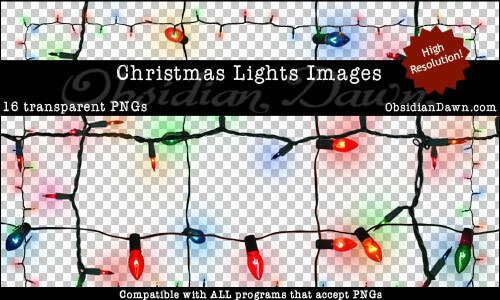 This set of christmas lights as transparent PNGs can be used in any program that will support *.PNG files. Photoshop, GIMP, PSP, and many more. These images are extremely high resolution, with the average size being about 800 x 3000 pixels @ 300 dpi. For those that don’t need high resolution, I have a low res version, where the images are about 400 x 1500 pixels. These come in strings of lights, horizontal and vertical… long and short… the large bulbs and the small ones. There’s even two sets of christmas light borders. All of them are transparent, with the backgrounds already removed and ready to be copied/pasted into your own designs!